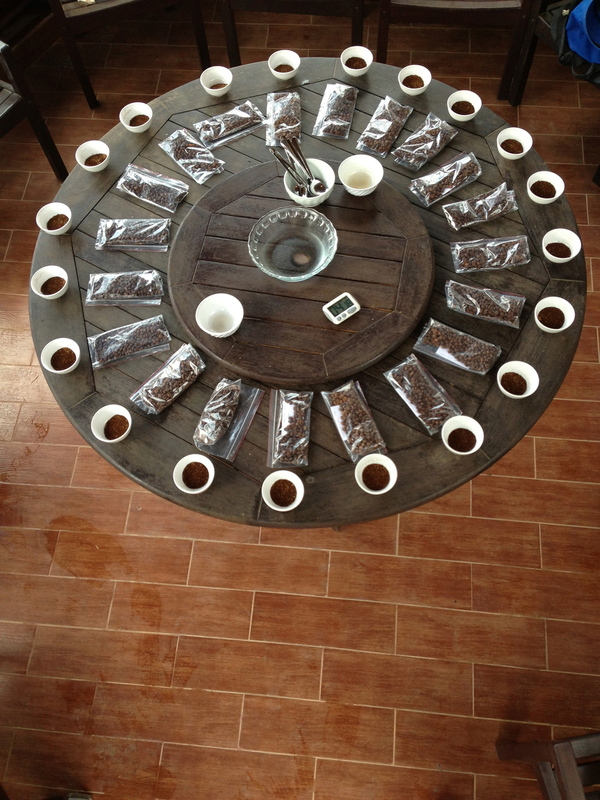 After three hours of set-up, roasting and labeling, the samples will rest until the next day's cupping. Between visits to producers and mills, and receiving samples from Indonesia and other Vietnam provinces from Michael Wood (fi-lan-thro-pe), there were about 20 lots to assess. While roasting, many of the coffees showed great potential. Some of the Catimor samples even caught our attention. Roasting took about 10 minutes for each sample, and I really got to know my little portable Lysander, finding the sweet spot after about 3 roasts. The roaster behaved very much like other sample roasters I've used, though we had to use a metal colander for cooling. With the two of us, we were able to develop a work flow that involved Michael weighing and taking moisture readings, stopping to help cool each sample to keep me constantly roasting. We set up the cupping in one of the rooftop dining rooms at the Dalat Fortress where I had been staying for the last three months. We set up in a rooftop dining room at my digs for the past three months, a place I had dubbed the "Dalat Fortress." 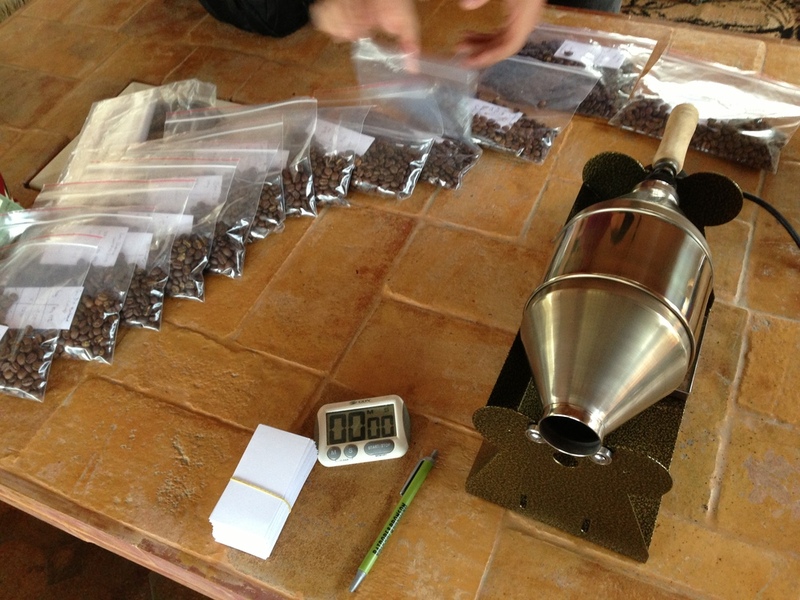 Upon grinding the samples, the room filled with beautiful aromas (and a few not-so-beautiful ones). Made up of mostly Catimor samples that Michael had collected over the past eight months, having the same cultivar really helped us to tease out differences in agricultural practices and processing. The samples ranged from "disqualified due to defects" to 78-86 points. Son La, in the North, has historically gotten all of the attention of Arabica-seekers. The sample we had was from OLAM (Singaporean processor) and it looked very well-graded. It smelled pretty good, but barely made 80 points. ACOM, a processor with a facility in Lam Dong province, was represented by a "Specialty Arabica" sample that scored 79 points. Michael's Indonesian samples ranged from funky to delicious, all scoring in the 80-85 point range. One sample, called Brastagi, was among one of the cleanest samples I've tried from the region, with sweet, maple syrup low-end, dried red fruits and citrus with a floral aftertaste. He was very proud of this one. fi-lan-thro-pe has been working with these Indonesian producers for over a year, trying to find market placement among Specialty buyers and roasters. Next up were some Dalat-area Catimor samples. Here's where the producer/processor passion began to shine. One sample in particular, a coffee from the Dan Kia area near Lang Biang Mountain, was one of the highest-scoring lots on the table, landing at 84.5 points. Clean, bright and heavy, this was the hybrid cultivar's shining example. Michael described the farm as one of the most pristine and well-managed plots he's ever seen in Vietnam, with the producer, a K'ho ethnic minority man, treating the trees like his own children. We really can't wait to get some finer varieties planted on his plot, as we think he'll really treat them with respect and love. One group of samples came from a special processing experiment Michael and a friend have been playing with, using different concentrations of clay in the water used for washing the mucilage from the wet parchment post-fermentation. With four levels of separation for this coffee from a Lac Duong, Lam Dong, producer, we expected the densest one to score the highest, coming from the assumption that denser coffees were better. It was actually the middle two samples that showed the most promise, both scoring in the 83-84 range, while the softest and densest samples were a disappointing 80 points. The star of the table, though, was an ungraded Bourbon from Cau Dat (near Dalat), a sample given to us by a friend in Ho Chi Minh City, Hiep Pham Khanh, who has been trading coffee in Vietnam for over 20 years. He had found this coffee, along with a Typica from the same producer, and has been roasting it at his house for the past couple of years. The sample was ungraded, so Michael and I did some hand-sorting to produce a "sorted" and "unsorted" lot. The unsorted lot tasted pretty good, and received a score of 82 (mold taints held it down). The sorted lot was very good, earning an 85 with its mild cherry acidity, heavy body and a sweetness that lingered long after tasting. This sample has been responsible for my enthusiasm about the potential of Vietnamese coffee, and has me looking for Bourbon trees every time I visit a farm. Honorable mention also goes to a Hiep-sourced coffee from Cau Dat, an ungraded Typica that scored 83 points during this session. With a crisp citrus acidity, medium milk chocolate body and floral aftertaste, this coffee has shown me that there is more than just one note to the Vietnamese Arabica song. It really has me wondering how other cultivars will fare in this reasonable climate, with good management and processing. I've since roasted both the Typica and Bourbon a few times and have really been enjoying it both iced and hot, brewed with Chemex filters in a Hario V60. These are a great start for what I think will be many years of great finds and projects, highlighting the reason I came here in the first place and giving me some solid footing for that start. I'm stoked for the next harvest, which begins in the Fall. Feral Typica seedlings on a Dalat plot just waiting for a loving home.